The intelligence minister has said that the country’s negotiators follow the Supreme Leader’s lead and defend Iran’s indisputable rights to peaceful nuclear energy. 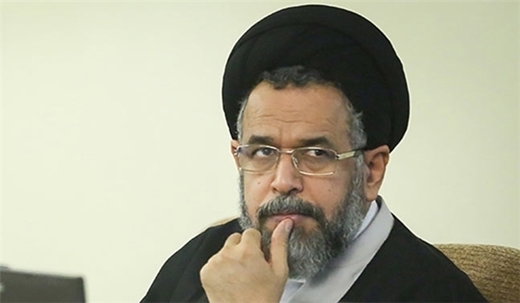 Intelligence Minister Seyyed Mahmoud Alavi said that Iran’s nuclear negotiating team has never crossed the red lines outlined by Supreme Leader Ayatollah Seyyed Ali Khamenei. Addressing a gathering of preachers in Khorasan Razavi Province, he said that the Supreme Leader has on several occasions voiced support for the nuclear negotiating team and also his concern about opposing parties’ performance. The minister further noted that the negotiators are following the Supreme Leader’s lead and are defending the county’s indisputable rights to peaceful nuclear energy. At the current juncture, all – both opponents and proponents – should support nuclear negotiating team in line with the Supreme Leader’s guidelines, Alavi said. Recalling designation of the current Iranian year as the ‘Year of Solidarity and Harmony between the Nation and Government’, he said that the issue should be heeded by all strata of the society. The minister also called on the preachers to pay attention to audience and present materials according to their needs. He said the youth should be directed towards rationality so that the enemies’ plot can be foiled. Describing ISIL as brainchild of British, US and Saudi Arabia’s intelligence services, Alavi said that arrogant powers have launched proxy wars to divide Islamic states and region.